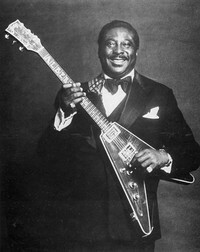 Albert King (1923 - 1992) was an influential American blues guitarist and singer and a major influence in the world of blues guitar playing. King was posthumously inducted into the Rock and Roll Hall of Fame in May 2013.He was one of the "Three Kings" of the Blue Guitar (along with BB King and Freddie King). King mat 1.98 meters and weighed 118 kg and was known as "The Velvet Bulldozer".